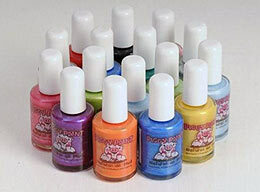 Mommy's Favorite Things: Piggy Paint Review and Discount Code!! Piggy Paint Review and Discount Code!! Save Big: Mommy Of 1 and Counting readers can save 15% off Their Orders through November 30, 2009. Use coupon code FALL15L. This even works on Sale Items... And if your order is over $25 you'll get free shipping! Who here doesn't love free shipping? I think I'll even use this code myself!